I really owe this project, this yarn, and this pattern all the pomp and circumstance achievable in a blog post. Love all around! 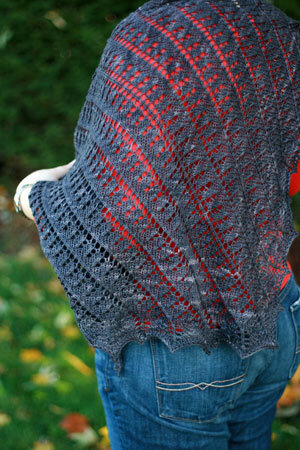 Pattern: Toe the Line shawl by Chrissy Gardiner. Yarn: Spirit Trail Fiberworks Paivatar in “Special” (MCN 08-03-01), 80% superwash merino, 10% cashmere, 10% nylon; 115 grams and 250 yards per skein. I used two skeins, basically in their entirety. Needles: US 6 Inox Express circs, 24″ long. As I mentioned earlier, this yarn seems much too thick for the recommended US 1-3 needles. Size: 62″ across the top, and 29″ deep. 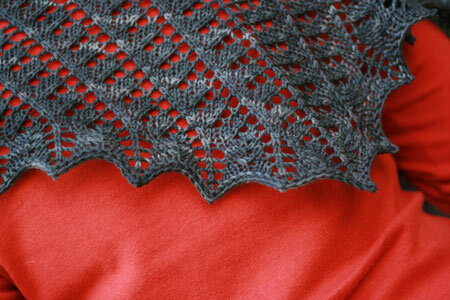 As you might remember, I attempted to match the size of the Leaf Lace Shawl. I came very close! This project was arranged with quite a bit of care and foresight, and I think it really paid off! The yarn is a thing of beauty. The texture and quality is fantastic – without any hesitation, I can imagine it as a sweater or a hat or a gorgeous baby blanket. The color is phenomenal – variegated just enough to add some interest, but not interfere with the lace pattern. It’s deep and grown-up without being bland. Purple in some light, and charcoal in another. Perfect. The pattern is perfectly written and easy to execute. Since the shawl is worked from the nape of the neck to the scalloped edge, the size is easy to customize, both to the wearer’s preference and to the amount of yarn available! The end result is geometric, rectilinear, but delicate at the same time, something I really wanted to achieve here. I will continue to insist that the home-brew edging was a bit of a half-assed job. But I concede that it’s not terrible :). If I took the time to knit a swatch, I could have done an even better job of merging the main pattern with the leaf-like scallops – just shifting the yarn overs from the middle of the leaf-like shape to its edge. Something to remember if I knit this pattern again. All in all, I’m obviously very happy with the way this shawl turned out, and so is my mom! However, I find it ironic that after all my insistence on this geometrically-influenced pattern being the perfect choice for her, my mom expressed genuine interest in the curvy, flower-inspired motifs of Knitted Lace of Estonia when I showed her the book. Tells you how well (or poorly) I can predict her favorites! And adds some new things to my queue, of course! It’s really beautiful Kathy! I love the way it looks with your bright shirt peeking out! That is sweet! 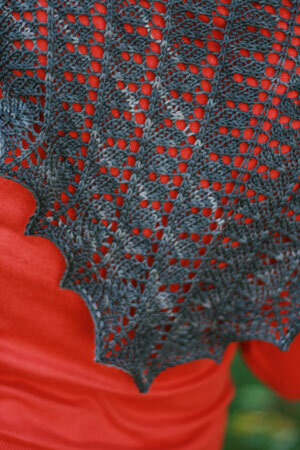 I love knitting lace myself, but get a little tired with the swirly/floral motifs. That block pattern is just what I’ve been looking for! WOW. Love the geometric lace! Watch now as 404583 people add this to their queues (myself included). A beautiful shawl! I love when I use up almost every scrap of yarn. Outstanding. I hope I don’t find out that my friend would rather a leafy/curvy shawl when I’m knitting her a geometric one against my grain. Lucky mom. Perhaps she just wants another one. It’s beautiful. And I rather like the way the decrease lines of the body line up with the between-yarnover stitches. Lovely. That’s such a pretty color. I wish I had your restraint and taste. That’s really beautiful. One question, though. Your yarn seems to be much heavier than the Helen’s used in the original sample, but the finished shawl size seems to be about the same. Did you deliberately create a denser shawl. If so, how did you work it out? I like your version a lot. Simply lovely! It is so nice to knit for someone you love – esp. a Mom. I can see in my minds eye her wearing it and saying -“My daughter made it for me!” Great job! Stunning!! And a fabulous colour. love it sooo much. great job kathy! Gorgeous! I love the colour. That’s the perfect gray. It’s beautiful! And thanks for the yarn info, as I’ve never seen it in person before. Gorgeous, darling. I adore the color! Ka-POW! What a knock-out, Kathy! You done good. That is gorgeous! I am saving my Spirit Trails yarn for something special after I finish all of the holiday socks. So well photographed to show the sublties of the yarn and detail in the pattern. Beautiful. I have been coming back a couple of times a day since you posted this. It just keeps drawing me back. The yarn you used is just perfect too. I think I need to round up the perfect yarn to start it today! Lovely. I also agree with Sara and Robin. This is so beautiful! Just lovely. 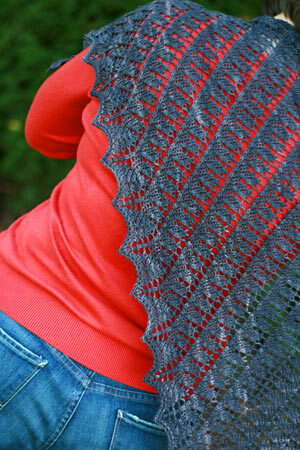 WOW, this shawl looks great!